The border guards at Zhuliany International Airport receive a training by experts of the Canada Border Services Agency (CBSA). EUAM facilitates two-days training in response to the request of the Head of the State Border Guards Service (BGS). The border guards enthusiastically participate in the hands-on trainings on recognizing forged travel documents, the Canadian entry regulations, visas and residence permits. “Can tell us which questions is best to ask to identify whether a person is using forged documents?”, asked Ukrainian participants. “Of course, we can cover that”, replied Canadian experts. “If you have doubts regarding the documents’ holder, you can call us and we will provide you with information within minutes”, added CBSA liaison officers. Ivo Kersten Strategic Border Guards Adviser explained that these trainings are conducted in the framework of the modernization of the education of the Border Guards. Help, Serve and Protect is the motto of this Project. 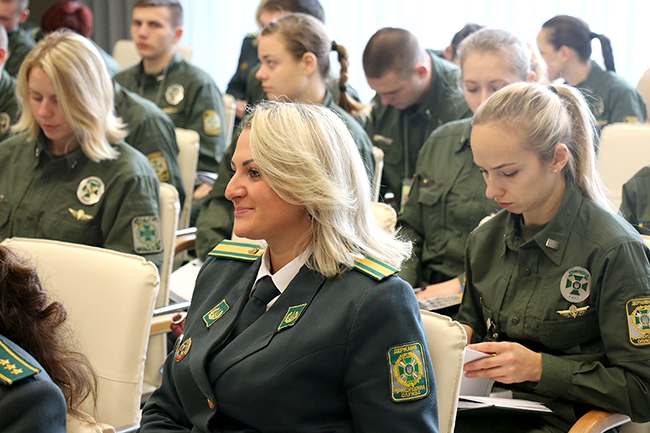 The BGS already took on board trainings provided by some EUAM experts during the initial in-house trainings of the first 160 newly trained border guards in September and October. “You may find something similar, you may find something different in our practices. We believe that your colleagues are also very professional”, said Canadian experts. Later in November and December additional trainings will be facilitated to these pilot project border guards by expert trainers from the Netherlands and the United Kingdom.